18. De La Rue, Warren (1815-1889). "On a photo-engraving of a lunar photograph," in: Monthly Notices of the Royal Astronomical Society, vol. 25, p. 172 and plate. -- London, 1865. 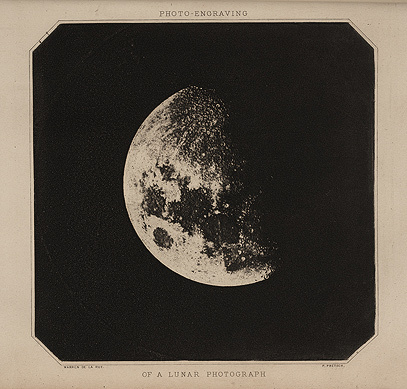 The first photograph of the moon was taken by J.W. Draper in New York in 1840, scarcely one year after Daguerre invented the medium. Within a decade many other astronomers, such as J.A. Whipple and G.P. Bond at Harvard, had recorded quite acceptable photographic lunar images. Still unsolved, however, was the problem of how to print such images for publication. It was De la Rue, an amateur British astronomer with an observatory at Cransford, who first conquered the technical difficulties. With the assistance of Paul Pretsch, who invented the process, De la Rue succeeded in producing a copperplate for printing from a photographic negative of the moon, by using the unusual swelling properties of gelatin after it is exposed to light. De la Rue called the print a heliotype; we would today call this a photogalvanograph, since the gelatin was electroplated after exposure and treatment. By the end of the century, gelatin-based plates would allow exquisite reproductions of the lunar surface, in the form of photogravures and collotypes.